I thought I'd share a technique I used on a card for a swap that I'm in. 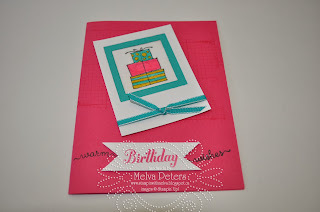 It's so easy and I love how the card turns out. 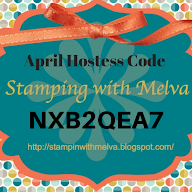 The technique is called Faux Canvas and is done using Stampin' Up! 's Crystal Effects. First a sample so that you can see the end look. It's so easy. Using a stamp that looks like it's drawn give the best effect, but any stamp will work (as you'll see from the other shares below). 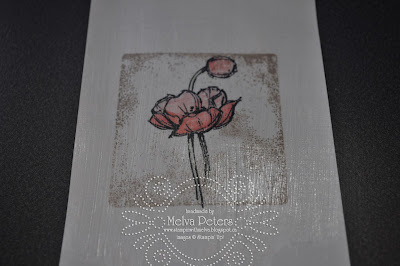 For this one I added a background by touching my clear block to the Crumb Cake Ink pad and then stamped. 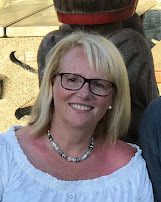 It's so easy to get a lovely background! I used blender pens to colour the image. If you are using markers you'll probably want to let it dry for an hour or so so that the ink doesn't smear when you add the Crystal Effects. 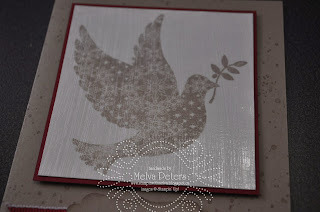 To create the Faux Canvas technique, drizzle Crystal Effects over your image - you don't need a lot, then smooth it out using a toothbrush. Got back and forth in the same direction until it covers your image. You need to work fairly quickly as it does dry quite fast and you don't want globs! You don't have to wait for it to dry before moving on to step 2 - turn your image 90 degrees and drizzle on more Crystal Effects and smooth it with the toothbrush. You'll start to see the "canvas" look at this point. So easy and so effective! 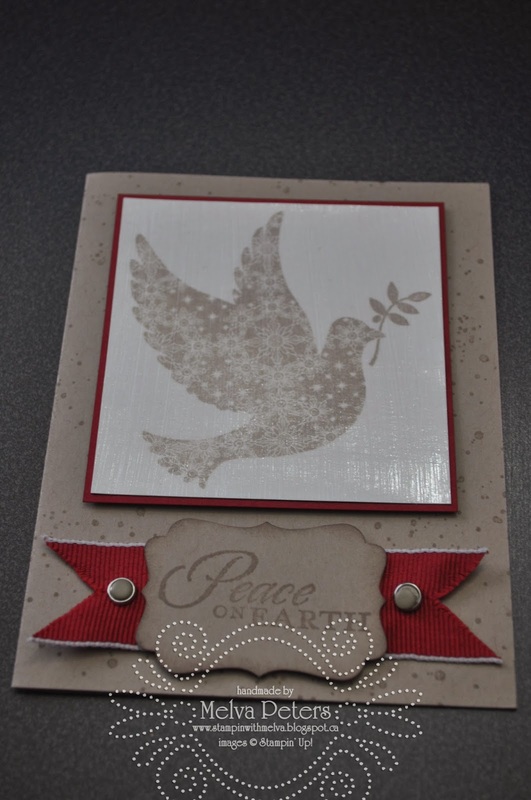 One more tip - cut your paper a little bigger than you want for the final card and then trim it so that you can cut off any finger prints. I can't share the final product using the image above (this is the sample I made when I demo'd this at Demo meeting) as the card I made as a friend bought it before I had taken a picture, but here's a couple of more cards that I made. 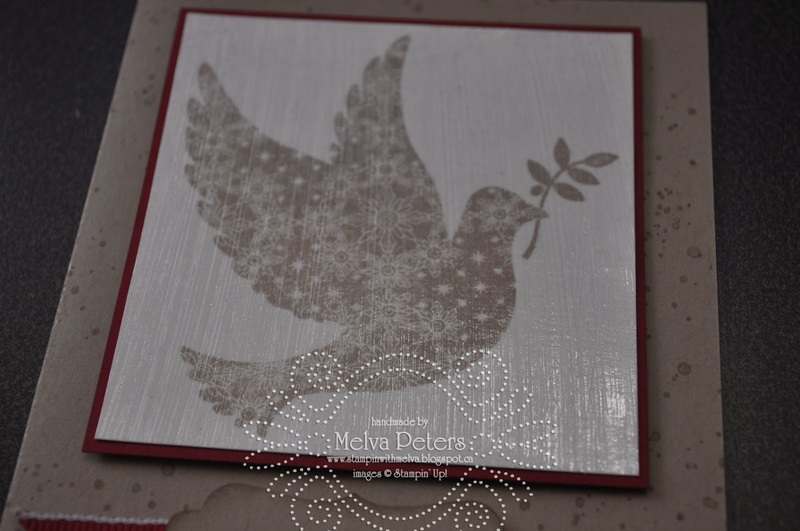 Card using Calm Christmas image and Gorgeous Grunge as a background. For this one, I use the technique to make it look like a Polaroid picture and did 2 layers of Crystal Effects spread in the same direction. I hope you enjoy this technique.